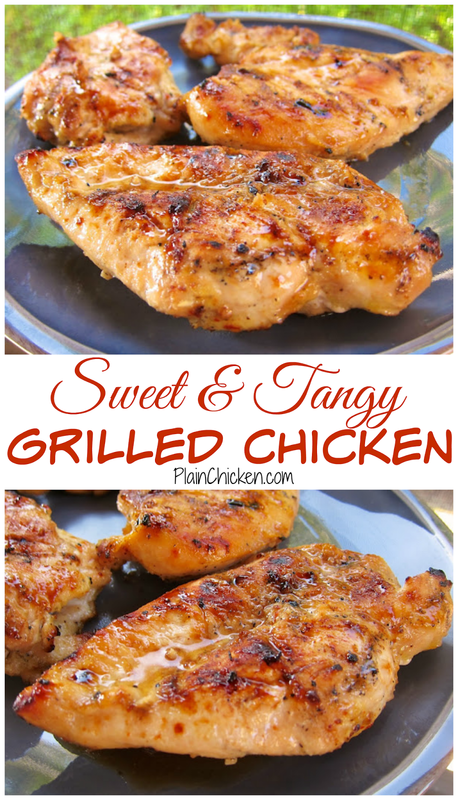 Sweet and Tangy Grilled Chicken Recipe - chicken marinated in cider vinegar, dijon mustard, garlic, lemon, lime and brown sugar. THE BEST! We make this at least twice a month. Great leftover on a salad or in a quesadilla. This chicken was SO good. I found the recipe on Pinterest and had to give it a try. The ingredients are a very unusual combination. It contains cider vinegar and brown sugar. I wasn't sure how it was going to taste. Well, it was unbelievably delicious! I think the vinegar mellows out the brown sugar. It definitely has a twinge of sweetness though. We have made this twice and plan on making it again very soon. We like to grill extra chicken and eat it for lunch. Give this a try ASAP! Whisk together cider vinegar, mustard, garlic, lime juice, lemon juice, brown sugar, salt, pepper and olive oil. Pour marinade over chicken. 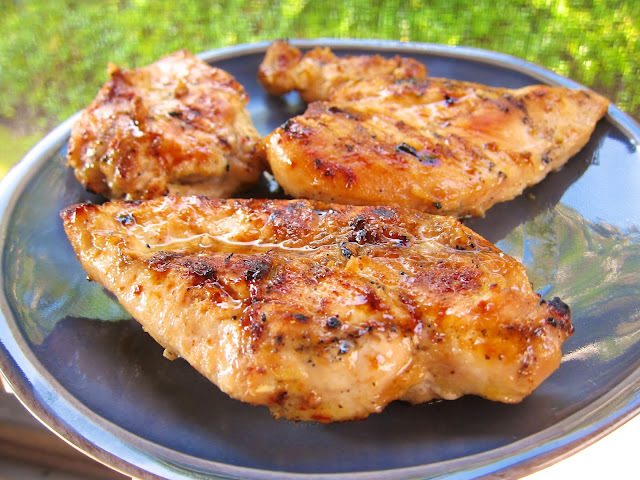 Refrigerate chicken in marinade for 8 hours, up to overnight. Grill chicken until done, approximately 12-15 minutes. Totally trying it. I love a marinade that doesn't require me to purchase anything! I know my family will LOVE this recipe:) Thanks for sharing! Have a blessed day, HUGS! This looks so good. I will definitely make it soon! 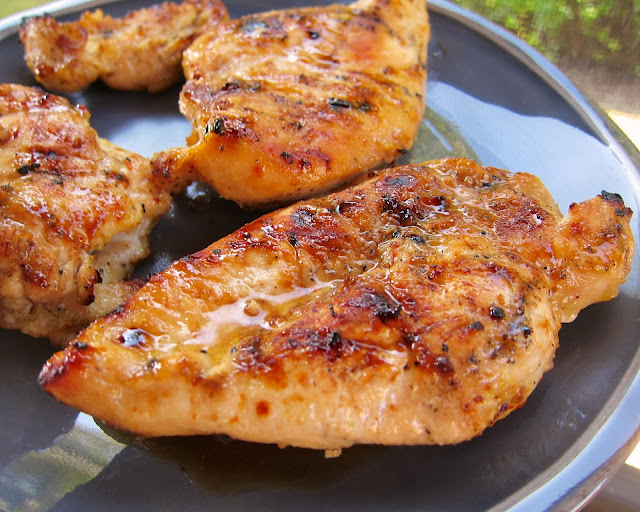 I have read in a couple of blogs that if you use lime juice in the recipe with chicken, that you should not marinate it for long...especially not over night because it becomes mushy. Are you familiar with these comments? Tammy - that is true, but there isn't enough citrus juice in this marinate to break down the chicken. I had no issues. This sounds so good. I also love the new back to school header. Kellie - I'm so glad you liked it!! I made this for dinner tonight. My son - the world's pickiest eater - loved it so it's definitely a keeper! I basically halved the marinade and used 3 breasts. Really yummy! Definitely something I'll make often. One note - I made it inside on the grill pan and found that it carmelized up almost too quickly on the first side. I'll try to keep my heat a little lower next time. This was very juicy and quite tasty. Amy - so glad it was a hit! Gonna give it a try with shorter marinating time and with chicken thighs because, well they were on sale and organic. Made this the other day but added the juice from a whole orange to it and let it marinade for 36 hours. It came out fantastic!!!.. Will be making it again soon. Did a 48 hour marinade on the chicken. Put on grill to cook. Very tasty.